This is College Physics Answers with Shaun Dychko. We have a 25 mega electron Volt proton going around in the cyclotron. So, with the magnetic field pointing downwards and the velocity to the right, we can point our thumb in the direction to the right and then our fingers point into the page. And our hand, our palm will be facing towards the center, and so this magnetic force is providing a centripetal force needed to keep this proton moving in the circle. So, this magnetic force is going to equal centripetal force and so that's qvB equals mv squared over r. And we can solve for r, by multiplying both sides by r over qvB. And this leaves us with r equals mv over qB. And now, we don't know what the speed is strictly speaking but we do know the energy of the proton. That's what it means to say at 25 mega electron volt proton as a way of expressing its energy. And we'll convert from electron Volts into Joules in a second. So the kinetic energy is one half mv squared. And so we'll solve for v by multiplying both sides by two over m and then take the square root of both sides, and you get v as a square root of two times kinetic energy over mass. And so we substitute in place of v with that expression. And we get r is m times square root two kE over m divided by qB. Now, this m cancels with square root m there, making square root m in the numerator. And so we can write the numerator as square root two mkE all over qB. And so we have square root of two times the mass of the proton 1.67 times ten to the minus 27 kilograms times its kinetic energy of 25 times ten to the six electron Volts and then multiply that by 1.6 times ten to the minus 19 Joules for every electron Volts. And then I'm not sure if this was covered in the Chapter, but an electron Volt is the energy of the charge of a single electron, the elementary charge going through one Volt. So, that's going to be the charge which is 1.6 times ten to the minus 19 Coulombs multiplied by one Volt. And so that's why it equals this many Joules. 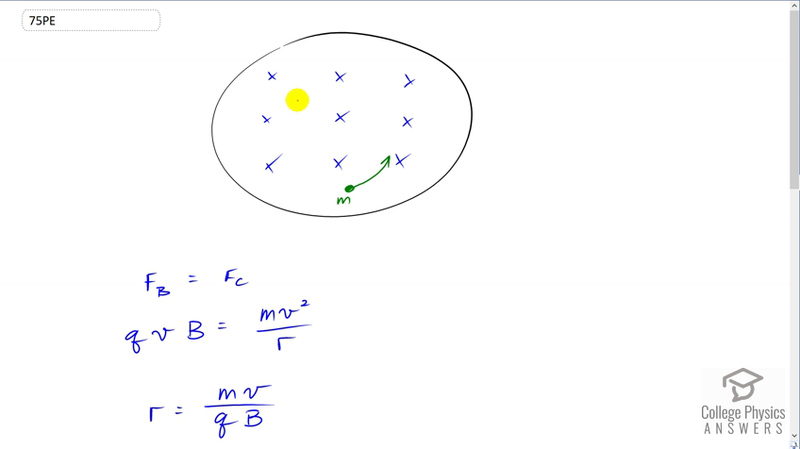 And divide that by the elementary charge times 1.2 Tesla and this gives 0.602 meters will be its radius of its path.